What are those gorgeous blown-glass bottles? 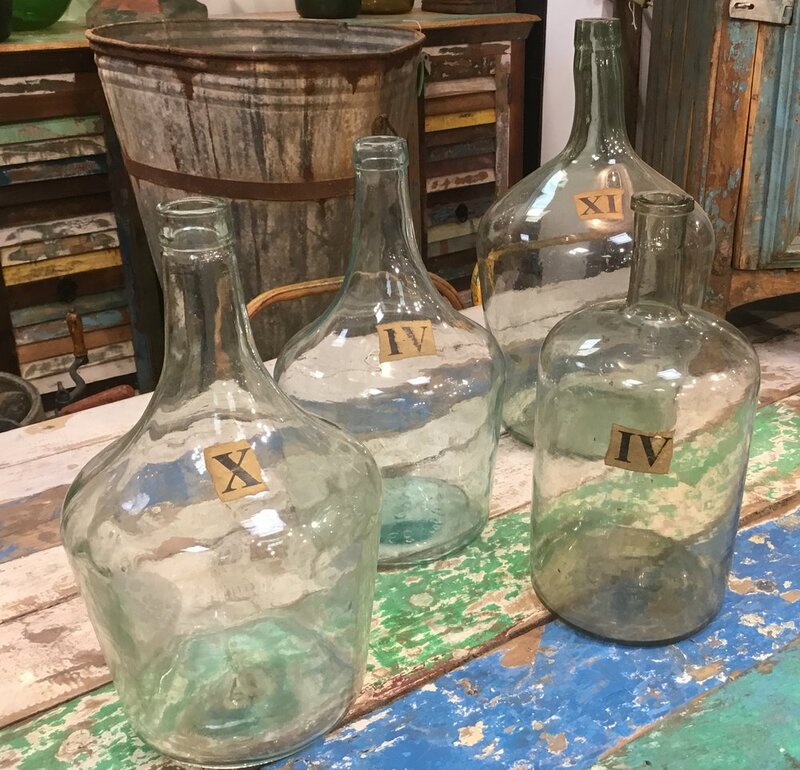 The large oval or globe-shaped glass bottles often used as accessories in French country and farmhouse style home decor are called demijohns. They are easy to spot with their bulbous shape and narrow neck. Demijohns were used in Europe as early as the 1400s for fermenting wine and beer. Demijohns were originally encased with straw and a wicker cover for protection. Where did the name “demijohn” come from? 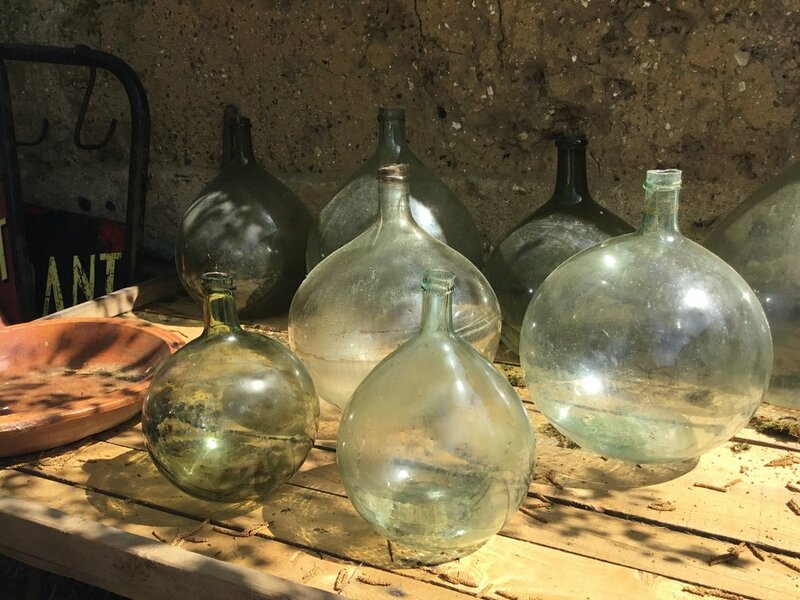 The name demijohn may have come from the Persian glass-making town of Damaghan, but the French story is much more interesting! The story says that in 1347, Queen Johanna of Naples (who was also Countess of Provence) was walking through the town of Grasse in the south of France. When a violent thunderstorm arrived, she was brought to the nearest castle of a gentleman glass blower. After a night spent, the Queen asked to be shown how the glassware was made. The glass blower was so nervous that he overdid the blowing and created an enormous bottle. The large bottle caused so much admiration that he decided to start manufacturing the big flasks. He named them “Dame Jeanne” (pronounced dem jon), which means Lady Jane in French. No matter what they’re called, we love them just the same! How to spot the old ones? Most European bottles were “free blown” creating an imperfect shape that makes each one unique. Other older bottles were blown into a wood or iron mold to form a specific shape. Newer bottles don’t offer the same uniqueness as antique blown glass. To finish the lip of the bottle, a rod was stuck to the bottom of the bottle leaving a mark. Bottles with pontil marks were typically made before 1870. Some new glass made in a glass-blowing specialty shop will also have these marks. Bottles blown into a mold may look “dimpled” if the mold was cold cast iron. Often times, the name of the vineyard was painted on bottles used for making wine. Sometimes a string was tied to the neck before shearing, leaving a string mark around the neck. Glass colors range from clear to shades of green or amber. Flat collars at the bottle’s lip are more typical of the early European vessels. Demijohns can be be used as a vase to display fresh or dried flowers, or even for storing wine, but they are just as beautiful when empty. Antique blown-glass demijohns, with or without wicker casing, add intrigue to every vintage or eclectic décor. I am always on the lookout for demijohns with interesting shapes, colors or markings to bring back to the shop. Please check our store and online shop for these unique treasures.